Definition at line 10 of file CRESmoothFaceMaker.h. 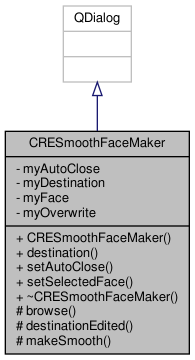 Definition at line 10 of file CRESmoothFaceMaker.cpp. References browse(), destinationEdited(), CREPixmap::getIcon(), makeSmooth(), myAutoClose, myDestination, myFace, myOverwrite, new_face_struct::name, new_faces, and nrofpixmaps. Definition at line 45 of file CRESmoothFaceMaker.cpp. Definition at line 197 of file CRESmoothFaceMaker.cpp. Definition at line 61 of file CRESmoothFaceMaker.cpp. Definition at line 207 of file CRESmoothFaceMaker.cpp. Definition at line 71 of file CRESmoothFaceMaker.cpp. References destination(), CREPixmap::getIcon(), myAutoClose, myOverwrite, and selectedFace(). Definition at line 49 of file CRESmoothFaceMaker.cpp. Definition at line 66 of file CRESmoothFaceMaker.cpp. Definition at line 54 of file CRESmoothFaceMaker.cpp. Definition at line 30 of file CRESmoothFaceMaker.h. Referenced by CRESmoothFaceMaker(), makeSmooth(), and setAutoClose(). Definition at line 32 of file CRESmoothFaceMaker.h. Referenced by browse(), CRESmoothFaceMaker(), and destination(). Definition at line 33 of file CRESmoothFaceMaker.h. Referenced by CRESmoothFaceMaker(), selectedFace(), and setSelectedFace(). Definition at line 31 of file CRESmoothFaceMaker.h. Referenced by browse(), CRESmoothFaceMaker(), destinationEdited(), and makeSmooth().